Home / Reynolds Training Academy Blog / PEAK 2013 ‘FUSION’ is right around the corner! This year’s ‘Peak’ Performance is just around the corner. 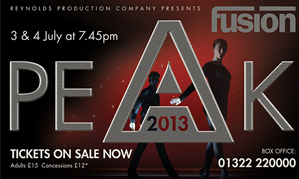 The show,entitled ‘Fusion’ will be held on 3 and 4 July 2013 at The Orchard Theatre in Dartford. Combining an exciting programme of acting, singing & dancing the show will demonstrate the talent, hard work and dedication of all the students. It will also be a showcase for our professional year students who are graduating in July, showing them at their Peak (as the title suggests). Good luck to Beckie and the rest of the Performers at ‘Peak’, do us all proud!